USPA NEWS - His Royal Highness, The Duke of York visited the UK Campus of Peking University HSBC Business School (PHBS) at Boars Hill in Oxfordshire on Thursday afternoon 14th June 2018. The visit was made after The Duke of York met both the Chinese president, Mr. XI Jinping and the Peking University President, Professor Jianhua LIN in Beijing this May as part of his Trip to China for supporting the Final Stage of the Pitch@Palace Innovation Programme 2018. 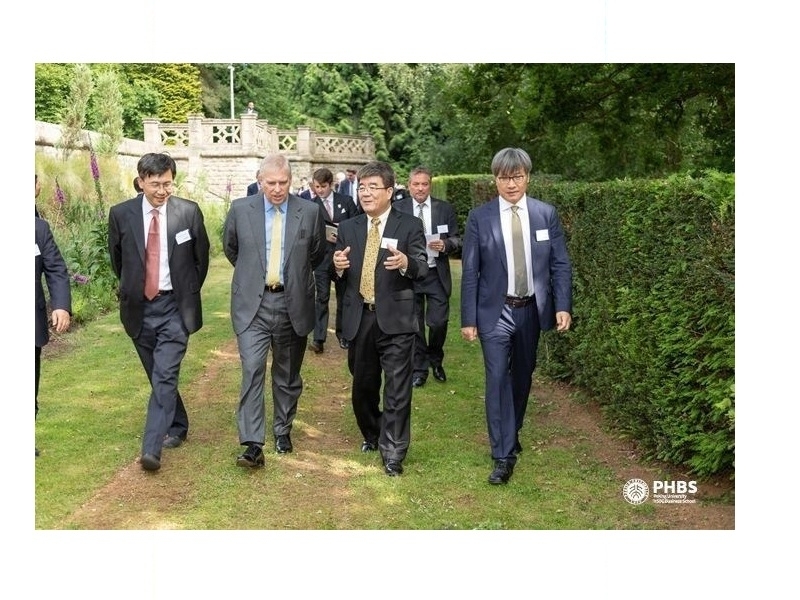 His Royal Highness, The Duke of York visited the UK Campus of Peking University HSBC Business School (PHBS) at Boars Hill in Oxfordshire on Thursday afternoon 14th June 2018. The visit was made after The Duke of York met both the Chinese president, Mr. XI Jinping and the Peking University President, Professor Jianhua LIN in Beijing this May as part of his Trip to China for supporting the Final Stage of the Pitch@Palace Innovation Programme 2018. With Sino-UK Relationships currently enjoying a "Golden Era", HRH's visit to the PHBS UK Campus comes at the Right Time for further enhancing the Link between the UK and China in Education. During the Visit, The Duke of York pointed out that "Education will make Chinese and British talk together, learn together, and would serve to break down Cultural and Historical Barriers on the Two Sides, which will increase Understanding. The UK Campus of Peking University is well-placed to increase Business, Investment and Partnership Collaboration between the Two Nations." Founded in 1898, Peking University is the Oldest Institution in China's Higher Education Sector. The University inaugurated its UK Campus on 25th March this year in conjunction with marking its 120th Anniversary. The Campus aims to provide Peking UniversitySstudents with an Opportunity for Cross-Border Learning during their Study in Peking University, expanding the Global Expertise of these Talented Individuals, particularly relating to Sino-UK/EU Relations. In the meantime, the Campus also provides British and other International Students with an Opportunity to build up their Understanding of and Networking with Chinese Businesses and the Economy. For People who want to understand & learn more about China's Economy & Development, The Duke of York acknowledged that the UK Campus, Peking University as an Excellent Place for People wishing to gain Knowledge relating to China. The Opportunity in the Campus is open not only to Young Chinese Talents to gain International Experience through a Period of Study in the UK, but also open to British, European and other International Students to learn the Necessary Business Skills before they move to China to deepen their Study, or directly explore Development Opportunities in Business & Investment in China. At the End of the Event, Professor Bo WANG presented a Gift from Peking University to HRH The Duke of York as a Token of Appreciation for his Visit to the Campus.